This animated school science about thermal expansion explains how metals undergo thermal expansion when heated, this has found application in planning for bridges, overhead wire, railway tracks and home applications. The animation contains linear, superficial and volumetric expansion. 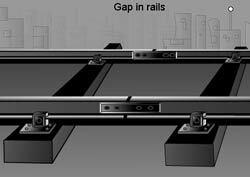 Why space is provided between rails and bridges ? 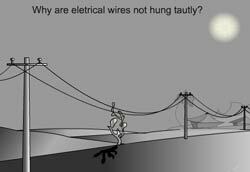 Why telegraph & electrical lines are never hung tautly between poles ? Why a tight glass stopper or a metal screw cap can be opened by heating them ? Why one end of a steel bridge is not fixed in concrete ? 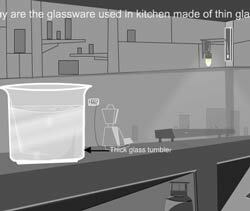 Why glassware used in kitchen are not made up of thin glasses ? What is thermal expansion ? Why heating leads to thermal expansion ? Does thermal expansion occurs in liquid also ?Does the thermal takes place in gases also ? Most substances expand when heated and contract when cooled. Not all materials contract/expand at the same rate; the amount of contraction/expansion varies depending on the material. The coefficient of linear expansion, is a proportionality constant that determines the rate of change in length in different materials when they are heated and cooled. In thermometers, thermal expansion is used for measurement. Liquid expand more than solids. Stained red ethanol has a relatively large coefficient of cubic expansion than glass . Temperature can be measured as it rises through the capillary faster. -If a lid of a glass jar is tight, holding it under hot water for a short time will make it easier to open. This is because the lid will be struck by the hot water more directly than the glass, and so it will expand sooner. Furthermore, metals generally expand more than glass for the same temperature change. 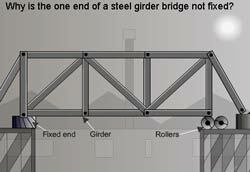 - If steel bridge expand or contract, it can cause structural damage. However, steel bridges are often mounted on rollers to prevent this problem. -Expansion gaps also exist in train tracks. -Water and steam pipes often have a U-bend in them to allow for thermal expansion. Ans: Space is provided for their expansion at the ends and between concrete slabs and iron girders. If the space was not provided bending of girders or formation of fissures and cracks will occurr in the bridge, leading to a collapse of the structure. Ans: A thermostat is a device used for maintaining a steady temperature. It's basically a thermometer attached to a switch, and it's job is to turn something on or off when the thermometer reaches a certain temperature. Its working is based on the behavior of a BI-metallic strip with the change in temperature. Often long BI-metallic strips are coiled into spirals. By coiling a very long strip it becomes much more sensitive to small temperature changes. The bimetallic expand sensing the temperature and turn the circuit off. When the temperature they contract to put the circuit on. Refer our animation or webpage on bimetallic strip to know more. Ans: The light you see when you look at the sky is sunlight that is scattered by particles of dust in the atmosphere. If there were no scattering, and all of the light travelled straight from the sun to the earth, the sky would look dark as it does at night. The shorter the wavelength of light, the more it is scattered by particle of the atmosphere. Because it has a shorter wavelength, blue light is scattered ten times more than red light. So during daytime, when you look up in the sky, the scattered blue light is the light that you see. When the sun is on the horizon, its light takes a longer path through the atmosphere to your eyes than when the sun is directly overhead. Most of the blue light has been scattered out. The light is reddish orange, the color of white light minus blue. Ans: Concrete contains steel rods if the expansion is not matched then expansion of steel rods can crack the concrete. If hot liquid is poured in a ordinary glass it may crack due to unmatched expansion. Not providing sufficient gaps for expansion of bridges or railroad can cause stresses and bending. Not leaving some space for engine coolant – filling it to brim- can cause it to overflow. Ans: On this site all of the animation deal with concepts and solutions, numerical problems are addressed wherever necessary. Concepts pertaining to topics like thermal expansion, light, heat, atomic theory etc are dealt through different animations. Ans: Each expands to a different degree, in solids the expansion is much lesser than in gas or liquid. A liquid or a gas will undergo higher degree of expansion as compared to a solid. This can be observed in thermometers where mercury or alcohol expand much more than glass to rise up in the capillary. Steam in a pressure cooker expands much more than the solid metal of the cooker and produces a high pressure inside the enclosed space. Ans: Substances expand on heating, When a substance is heated, its constituent particles move around more vigorously and by doing so generally maintain a greater average separation.. This expansion is either linear, surface or volume based, for example a wire will expand linearly while a metal ball will expand volumetrically. This expansion is governed by the temperature difference to which the metal is subjected. Same holds for contraction. Diffusion is observed more in gases though in solids, solid-state-diffusion does take place. In diffusion the molecules of a gas moves in a random manner and collides with other molecules to spread from an area of high concentration to an area of low concentration (at times through a semi-permeable membrane). This phenomenon takes place in liquids also. Ans: Compression of a gas increases its temperature (as per Charles’s law) while expansion produces cooling, heat is exchanged with the surroundings during the process. Heat is released when expansion occurs and vice versa. Major applications are: 1) Gas expansion turbines or turbo-expander, a centrifugal or axial flow turbine through which a high pressure gas is expanded to produce work and in steam turbines 2) Compressors use gas expansion and compression for refrigeration and air-conditioning, one of the application is in pneumatic equipment example pneumatic drill for doing work using compressed gases, also for feeding fuel at high pressure by turbopumps used in space shuttle and rockets 3) Two and four stroke engines used in automobiles use thermal expansion of gases for moving a piston. Ans: Thermal expansion and contraction produce stress in virtually every object, rocks break apart due to irregular expansion and contraction, buildings and bridges develop cracks and fractures, cantilevers, beams, wires, cables all made of metal undergo expansion in summer and contraction in winter resulting at times in failure of a structure. Ans: In ice, two H-atoms are linked with O-atom by covalent bonds and the remaining two H-atoms are linked to O-atom by two H-bonds. Thus in ice every H2O molecule is associated with 4 other water molecules by H-bonding in a less dense tetrahedral fashion. This produces an open cage-like tetrahedral structure of ice with a large empty space. We have answered it in detail in an article, go to http://www.goalfinder.com/articles-g.asp. We will include a children one too later with more pictures. Ans: To the modern bridges – Nothing, as space is provided for their expansion but continuous expansion and contraction cycle, stresses the material and over a long term weakens the bridge, so its continuous maintenance is necessary. If the space was not provided bending of girders or formation of fissures and cracks would have occurred in the bridge, leading to a collapse of the structure. Ans: Metals expand on heating and contract on cooling, a railway track is bound to ground at regular intervals, if a long railway line was used in place of spaced sections, the expansion would be cumulative and the line would curve unevenly all across its length. In case of concrete, the components have different coefficients of expansions hence internal stresses are caused and if the margin for cumulative expansion is not provided for then faults will take place. Ans: Hi, this is not a homework help site; we are giving you hints and suggest that you research them out yourself. Search for bulb or dial thermometer (it uses bimetallic strips), thermostats, or a train track. Ans: The answer is no – wave speed is dependent upon medium properties and independent of wave properties. So changing amplitude, frequency or any other wave parameter does not affect speed. However changing the properties of medium (elasticity in case of sound) or the medium itself will affect speed.